Sometimes you open your web browser and suddenly notifications from the site you visited pop up on the right side of your browser screen. Do you want that to add in your blogger blog too? If yes then this tutorial will guide you easiest and fastest way to add web push notification to your blogger blogs! Web push notifications are basically the messages from websites that pop up when you open your browser. When you click them, you get a straight ride to that website's page from where the notification came. They can also be shown on your desktop screen even when you don't open your browser. These notifications boxes are similar to mobile push notifications, the only difference is that mobile push notifications come from the apps that you download in your phone. Why you need to add web push notification? Popular websites like Facebook, Pinterest, LinkedIn and Twitter are already using web push notification and mobile push notification so have you ever wondered why they use it? Web push notifications are a great way to maximize engagement with your website or mobile apps. People don't want to type your website URL every other time to find your site. If you can help them get back then nothing could be greater than that. It will surely help you increase page views and returning visitors on your websites or Blogger blogs. 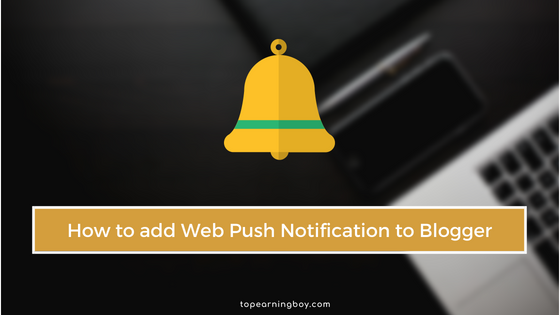 So now forget everything and let's take a look how to add web push notification to your blogger blog! How to add web push notification to Blogger? For this purpose, we will use One Signal free service that allows you to add web push notification to your websites, blogs or mobile apps in no time. Let's get started! Register your account using Facebook, Google or any other email. After successful sign up following window will appear. Click on Add a new App. Give your app a short name. Your blog name would be best! Add a permission prompt for your web push, We used Subscription Bell here. One signal will guide you in every single step so don't worry about that. Then configure your Welcome Notification, this message will appear when user subscribes to your blog. Search for </head> tag and just above that tag paste the copied code! Save your template and we are done! I tried my best to make this tutorial as simple as possible and guide you but if you still have any problems then you can find them on documentation page provided by One Signal. This is how you can implement it not only for your Blogger but WordPress blogs and mobile apps!